At the end of December, the Joint Committee on Taxation (JCT) released its final dynamic analysis of the Tax Cuts and Jobs Act (TCJA). JCT's analysis concludes the bill will have a modest impact on growth in the near term but almost no effect after a decade. After accounting for this near-term growth, the $1.46 trillion bill will still cost $1.07 trillion. This is consistent with estimates of the previous iterations of the House and Senate bills and inconsistent with claims that the bill will pay for itself or substantially accelerate sustained long-term growth. JCT projects the final tax bill will increase Gross Domestic Product (GDP) in each of the next ten years by an average of 0.7 percent – which is similar to its estimates of prior versions of the bill. 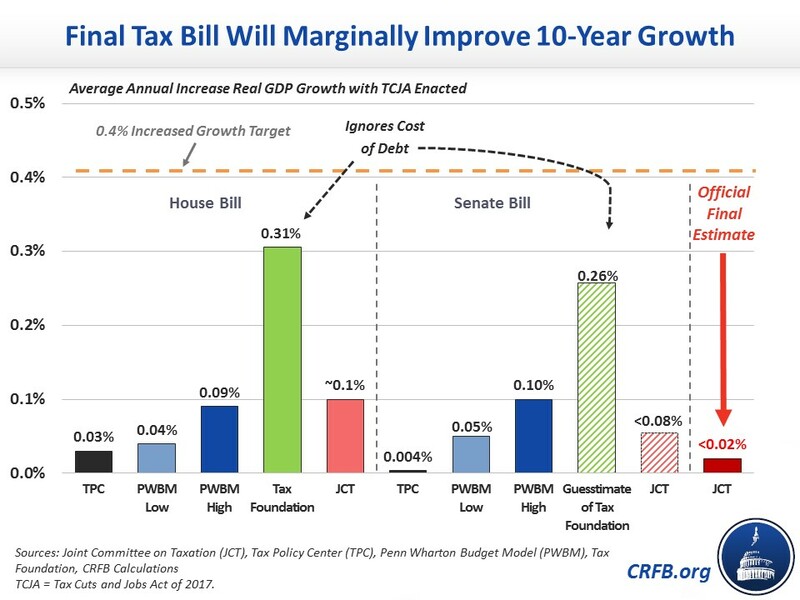 Importantly, though, JCT finds most of this increase will disappear toward the end of the decade as various parts of the bill expire and debt accumulates. This results in the final bill increasing average GDP growth by just 0.01 to 0.02 percentage points per year over a decade. In other words, it will improve growth by one-fortieth to one-twentieth of the 0.4 percentage points claimed by some of the bill's advocates. Even though JCT projects the bill will do little to improve economic growth over ten years, it will have a larger effect on the economy in the near term. Although JCT does not provide a year-by-year breakdown, we believe based on this analysis that the bill would increase the average growth rate by about 0.1 percentage points per year over the next five to eight years – with most of that growth appearing in the first year or two. This increase in GDP will generate more tax revenue, resulting in $385 billion of dynamic feedback. 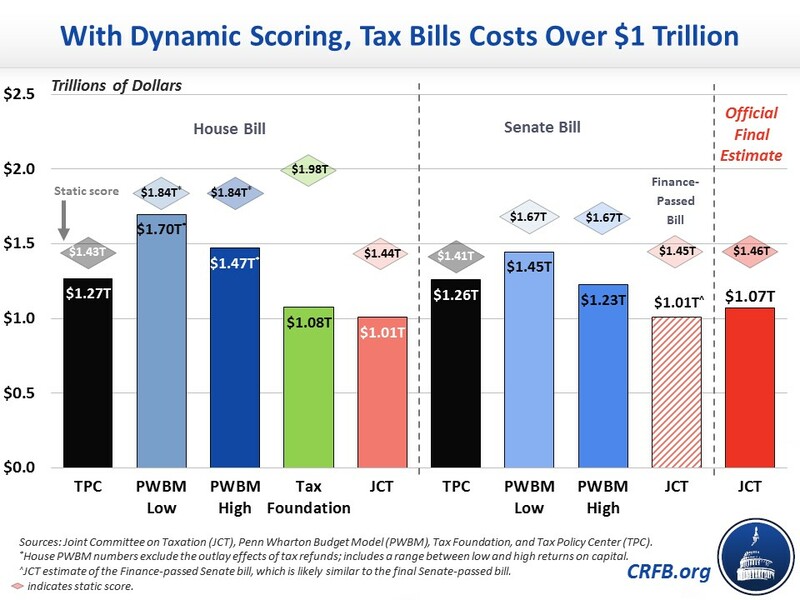 While some have claimed that growth will ensure the bill does not add to deficits, growth will actually only offset a little more than one-quarter of the bill's $1.46 trillion conventional costs (and one-fifteenth of its gross costs). On a dynamic basis, the legislation would still cost $1.07 trillion over a decade – excluding interest and the hidden cost of gimmicks. Unfortunately, the tax bill will add significantly to an already dismal debt situation – even after accounting for economic growth. And ultimately, the bill will have little to no effect on GDP at all over the medium and long terms. Making the whole bill permanent would help to improve its effect on ten-year growth, but at the cost of significantly more debt that would ultimately slow growth in the long term. To truly improve economic growth, lawmakers should pursue a series of economic, fiscal, and labor market reforms. Near the top of the agenda should be a plan to reverse the fiscal damage from the recent tax bill by putting forward more revenue increases and/or spending reductions. At the same time, policymakers should address the underlying structural imbalances through long-term entitlement reforms to make Social Security and Medicare solvent and put our nation's fiscal trajectory on a sustainable path.